Tenggiling is the Indonesian word for pangolin, a kind of anteater relatively common in this part of the world. The island of Tenggiling has a lot going for it in the tropical beach paradise stakes. Not only is the island blessed with a breathtakingly beautiful beach, gorgeous white sand and gin-clear azure-colored water, it also has a solid covering of tropical rainforest, which has ensured Tenggiling is still in a virtually untouched state. Indeed, the interior of the island has almost certainly not been fully explored by anyone to this day. Small wonder then that Pulau Tenggiling is widely regarded as one of Anambas Archipelago's most alluring locations for a private get-away holiday. But there's more. Tenggiling is part of a cluster of islands, which includes Pulau Matak to the east. 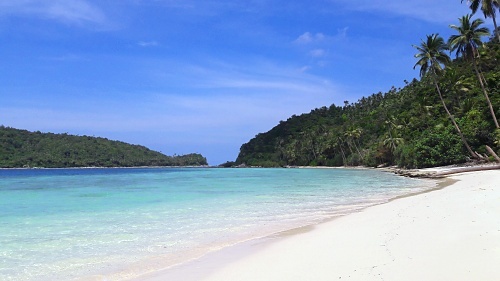 Tenggiling's sheltered location results in the island's water remaining mostly calm and pleasant year-round, ideal for the paradise beach locations of choice that Tenggiling is fast on its way of becoming, both for local weekenders and overseas holiday-makers too. To top it off, Tenggiling also has deep-water access just off the island, perfect for larger vessels, such as LOB diving outfits keen to take a well-earned breather from their busy scuba diving agenda. Tenggiling is just about ideal for a couple of days of fun in the sun on a picture-perfect little island that's endowed with a picture-perfect bounty beach. Pulau Tenggiling: Escape. Explore. Unwind.